With Taurine added for clear eye, added Linoleic to promote healthy skin and glossy coat. 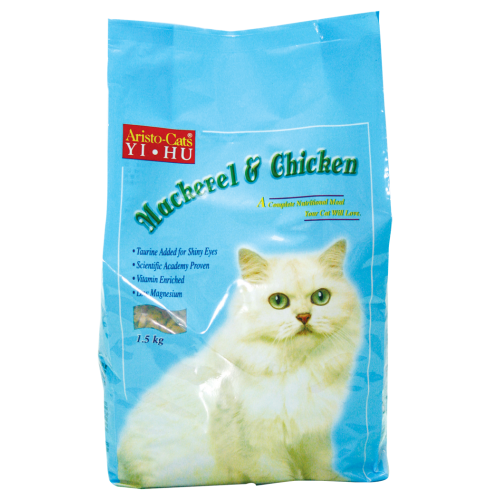 Poultry meal, mackerel fish, ground yellow corn, corn gluten, soybean meal, wheat middlings, poultry fat (preserved with mixed tocopherol - a source of vitamin E), potassium chloride, DL methionine, taurine, salt, chloride, calcium sulfate, zinc oxide, manganese sulfate, ascorbic acid, niacin, vitamin A acetate, biotin, calcium pantothenate, thiamine, mononitrate, pyridoxine hydrochloride (vitamin B6), vitamin B12 supplement, riboflavin supplement, menadione sodium bisulfate complex (a source of vitamin K activity), vitamin D3 supplement, potassium iodide, folic acid, sodium selenite. Aristocats Premium Formula is fed either dry or moistened with warm tap water. Its your choice, but either way your cat or kitten will be provided with complete and balanced nutritional requirements. If feeding is moist, simply stir one part warm water to four pars Aristocats Premium Formula. Feed immediately after stirring while it is warm. Fill your cat's bowl in the morning with Aristocats and leave it there for your cat to nibble on throughout the day. 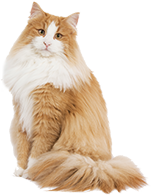 Do not add vitamins or minerals as Aristocats feline formula is already a complete and balanced diet. Add water to soften the food, feed them with the Aristocats Cat Food (Feline Formula), they will consume at intervals throughout the day, use the chart as a guide and feed the suggested amount 2-3 times a day. decrease the amount by 25%. Remember to provide plenty of fresh water in a clean container at all times. Regular veterinarian visits are recommended to ensure good health. Store all dry pet food products in a cool dry place.